How’s it?! 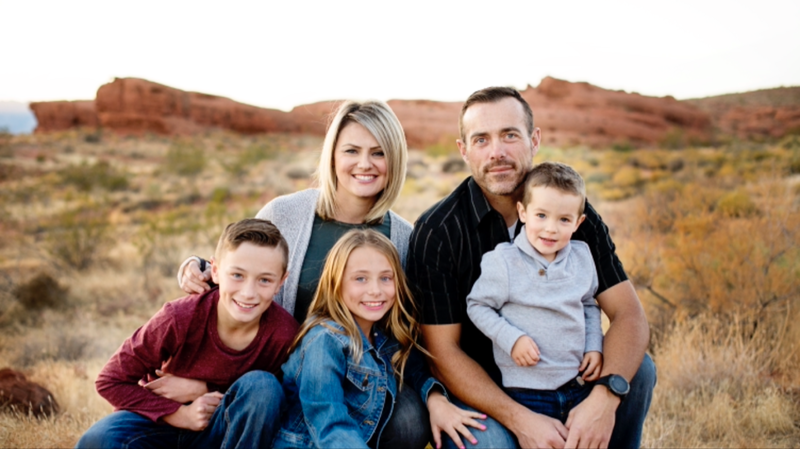 I’m Angie Anderson, I live among the beautiful red rocks and desert of Southern Utah! I am a wife, mom of 3 awesome and exhausting kids ages 14, 10 and 4. 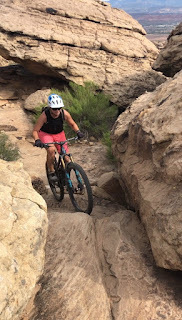 I’m also a hairstylist and Founder of the women’s mountain bike group, Women Ride! Mountain biking has become a major part of my family’s life! I started riding mostly to hang with my husband and have another hobby to enjoy together! I didn’t know that it would develop into such a passion! I was a Runner and casual triathlete (although not very fast or good at either!) but when I started mtn biking, something clicked! I love adventure and being outside in the dirt, and felt that mountain biking was something I really enjoyed and was kind of good at!! I am super social and like to hang out with my friends, so it was natural to start a women’s club to gather women together to ride!! My most favorite thing about riding with women is how incredibly encouraging and positive they are! Every race I’ve done has had a cheering section for the other lady racers! That doesn’t happen in many other sports and I feel lucky to be a part of it!! I first started riding very casually, getting the hang of the basics. My husband taught me as I went, and once I felt comfortable, I wanted to go faster and on more difficult, steeper trails. That’s when I really started to love mountain biking! Braking was a challenge, learning to use only one finger, and when to let off! Also, a good quality bike with the best components you can afford makes a world of difference. Knowing that you’ll be able to stop because you have good brakes is always a good feeling!! Learning to get back behind your seat and how to have loose arms also helps tremendously in bike control. Those are all things you have to practice doing in order to be comfortable. I recently had a lesson with a coach who corrected my cornering. I THOUGHT I was doing it correctly but was super inefficient, and I’m learning to change those bad habits! It’s frustrating to re-train your brain and body, but correct technique will only make you faster! You started mountain biking so you could join your husband on rides. Do you have tips/suggestions for folks wanting to ride with their partner when there might be a gap in experience? Ha!! Ask them to have patience!! My husband is a really rad rider, and I wanted to be able to ride the same trails, so that was my motivation!! Even still, he’ll ride ahead at his pace and stop to wait for me if I’m behind. He likes to ride fast, like race pace, for most every ride, so I know if it’s just us riding, it’s going to be a max effort ride. If I’m not feeling a hard ride, I’ll go by myself or with a social group where it’ll be a more casual pace. Trying to keep up with him has definitely made me a better rider and learn how hard I can push myself! Mountain biking is becoming a family activity! What do you do to keep it fun for your kids? My kids like being outside and active, so it’s not too hard to get them out. We have quite a few friends who ride with their kids, so it’s been fun to go on rides and trips where we can all ride together. Your kids are less likely to complain when they’re with other people!! Our kids also like to go fast and aren’t too scared, which makes it fun for everyone! The apples don’t fall far from our tree!! YOU have to want to ride for you, no one else. 75% (or more!) of mountain biking is fear. If you’re terribly afraid of going fast or over rocks, it’s not a good fit for you. Taking a lesson (even informal) from someone who knows what they’re doing is super beneficial. There are so many quality coaches in most every area, take advantage of their expertise!! They have different ways of explaining skills for all levels and experience! Clips!! Once I really started riding more aggressively, I got tired of my feet slipping off the pedals and stabbing me in the calf! Southern Utah has very technical trails and it’s to your advantage to clip in! So many are scared to be connected to the bike, but I felt like I improved greatly once I did! Definitely!! I’ve had my share of hard landings! I crashed pretty good in Moab on a cliff edge and it took me a few weeks to feel comfortable, mentally, again. I also broke my wrist last year and was in a cast for 6 weeks. That was hard mentally and physically! I tried to run as much as I could but it’s not the same as biking and I lost a lot of fitness. It made me more aware when I’m on my bike and I’ve learned to hold back a bit. What inspired you to create the group Women Ride Utah? Ahhhh!! I love mountain biking and I’m super social! I wanted to share that and get more ladies out together on bikes! Women learn differently from other women, so having a fun, safe place for ladies to ride is amazing! My whole goal was to introduce women to others who might not be friends otherwise and it makes me so happy to see that happening!! How can folks join your group? 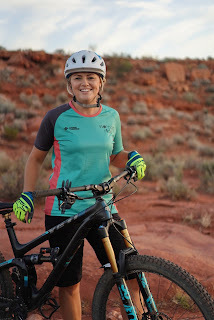 We’re womenrideutah on Instagram and Facebook, womenrideutah.com or you can email me at womenrideutah@gmail.com. Our group is pretty rad!! What has been the best thing to occur since creating your women's ride group? Seeing the amazing improvements these gals have made on their bikes! It’s awesome! Also, seeing the friendships made! I love hearing the riding plans being made independent of our group!! That’s such a huge reward to me! I LOVE going fast down a rough or rocky section, challenging myself, sometimes scaring myself a little, and seeing where I’ve worked hard and made improvements. There is no better confidence booster than cleaning a hard section or climb that you hadn’t been able to before. I love a challenge, and getting a little adrenaline doesn’t hurt either!! Right now I’m on a 2018 Yeti 5.5. Her name is Shaniqua! I freaking love my bike! I’ve been racing Enduro and it’s the perfect bike for it. I have an Ergon Women’s SM Pro saddle and custom Flexx handlebars by a local Utah company, Fasst Co. Those additions alone made a world of difference in comfort! I feel super lucky to have a nice bike and it makes it easier to ride well! So many things! Fear, kids, money and time to name a few! A bike is a big investment to make, and it’s hard for a lot of women (especially moms) to throw down on a bike. Taking time for yourself, away from a spouse, family or work is tricky, but so worthwhile! My mental health thrives on it and I’m a better wife and mom when I’ve made the time to be out on my bike. I’m seeing a big shift from some major companies in designing products for women. They’re realizing that women will spend their money on important components to biking and it’s a niche that’s starting to open up finally! I’ve definitely had times where I’ve felt like I haven't been taken seriously as a rider, but I’m seeing that mindset change as more women are getting sponsored, being employed by and running businesses. I love introducing a sport to people that maybe they wouldn’t otherwise explore! Seeing women learn skills and put them into practice while they’re out having fun and enjoying the outdoors is amazing!! And then seeing their confidence boost in return makes me so happy! I love it!!! I love my kids and love to embarrass them even more! Usually that is by head banging to my favorite Queen song in the car, home or grocery store or kissing their faces uncontrollably! I keep reminding them that I’m cool, but I’m not sure they agree! !